The Ukulele Play-Along series will help you play your favorite songs quickly and easily, with incredible backing tracks to help you sound like a bona fide pro! Just follow the written music, stream or download the online audio to hear how the ukulele should sound, and then play along with the separate backing tracks. The melody and lyrics are included in the book in case you want to sing, or to simply help you follow along. The online audio player, Playback+, allows you to slow down the audio without changing pitch, set loop points, change keys, pan left or right, and more! 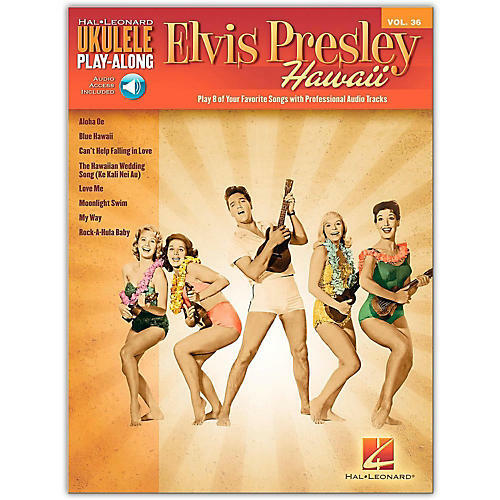 This volume includes 8 Presley island favorites: Aloha Oe • Blue Hawaii • Can't Help Falling in Love • The Hawaiian Wedding Song (Ke Kali Nei Au) • Love Me • Moonlight Swim • My Way • Rock-A-Hula Baby.